One of Britain’s best loved dishes but despite our love for the dish you can’t deny we do lack some finesse in certain shops where it is served. Some leave a lot to be desired. However, there are some very good examples out there and I was lucky enough to find one of them……in Berlin. 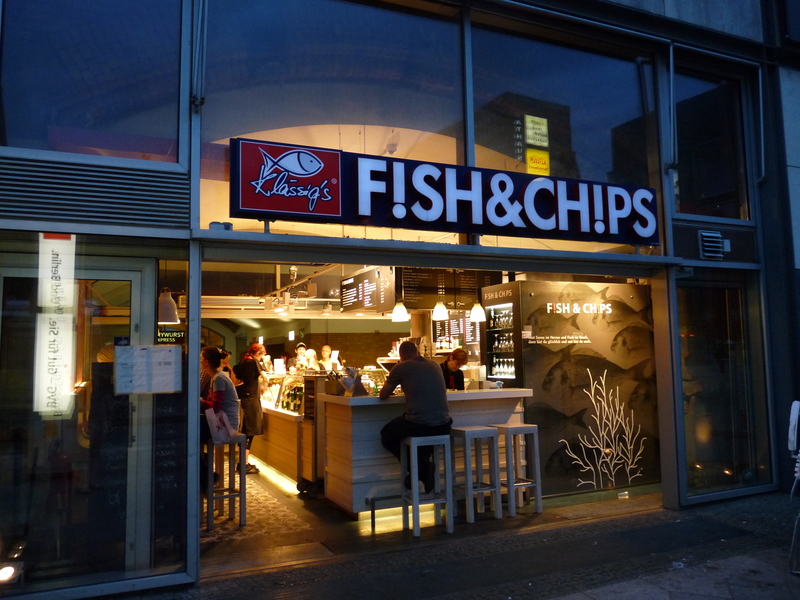 Klassig’s Fish & Chips. I was waiting for one of those impeccably clean, fast and on time trains (literally within 30 seconds of the expected arrival time) when I stumbled across this little beauty in Berlin’s Central Train Station. Well lit, well branded and perfect location for the customer demographic. It had a down to earth feeling of really good honest food. 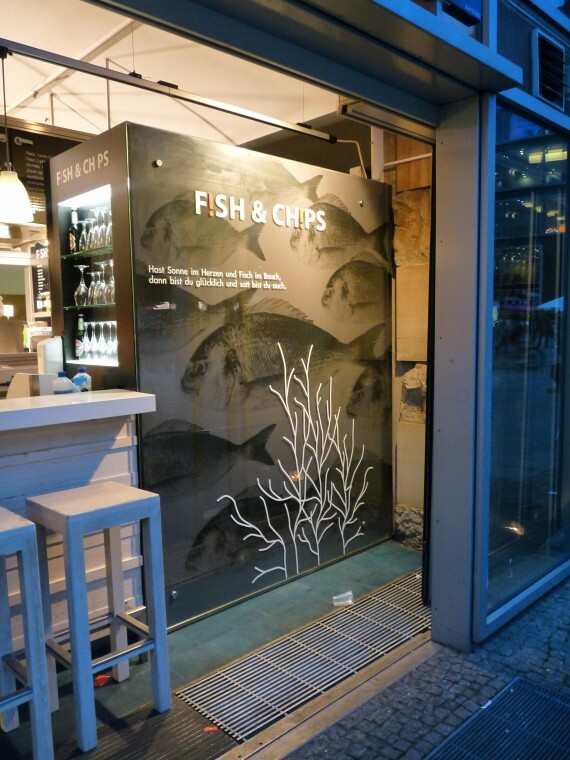 The natural woods on the counter and beautiful ceramic floor tiles gave it a class above the standard ‘chippy’. Their strap line captures it all ‘Have Sun in your Heart and fish in your belly, then you’re happy and you’re satisfied’ (I think I have translated it properly, if not please let me know). A neutral colour palette with a suggestion of the sea and origins of the raw ingredient without over indulging in suspended lobster baskets or sand on the floor. 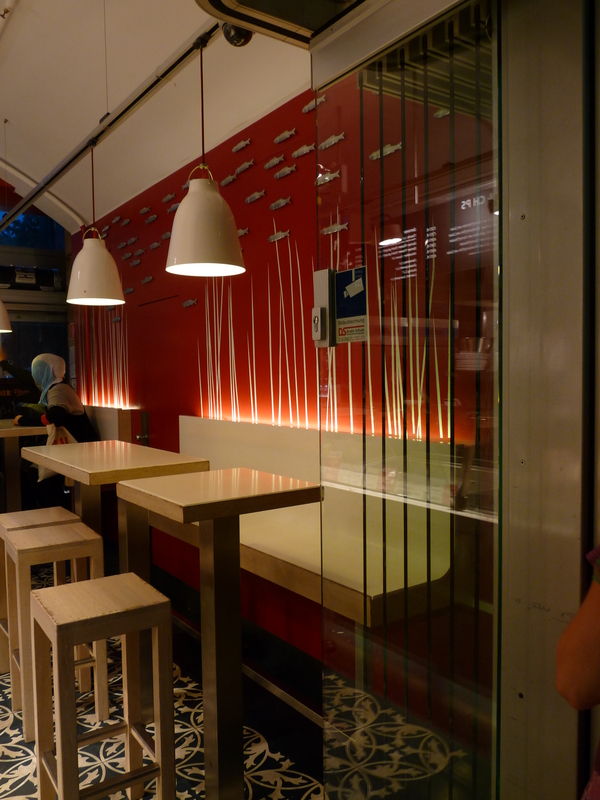 The feature wall above the Banquette seating is simple and carries the only accent colour in striking red. A colour that is not naturally synonymous with fish, chips or the sea but has also been the logo colour of choice for Harry Ramsden’s brand since 1928. The seating style is simple and lends itself to the true ethos of fast food with only high poser tables and counter stools encouraging a fast turn over of customers. But also maximizing seating capacity in the very small floor plan of this outlet. 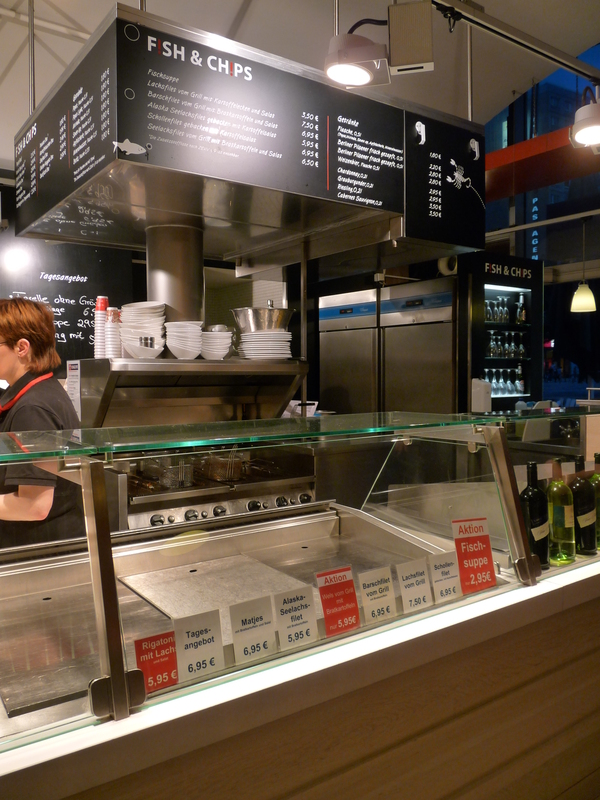 The small prep area behind the L-shaped Counter is compact with a central frying suit. The suspended extract Canopy giving the perfect surface and location for the easy to read menus. I did also notice, not only here but in other food outlets, including the hotel buffet where I was staying, that the condiments, sauces and sides were served not in plastic or paper dixy cups, but in a wafer version. All completely edible with no waste. I unfortunately failed to take a snap shot of this discovery, but it too delighted me. It’s not until writing this post that I have noticed all the litter in the bottom of my photos, and what could be a warm glow in my British heart, either that or a slightly less shameful feeling for keeping Britain tidy. This entry was posted on Monday 21st May 2012 at 3:26 pm and is filed under Design, Foodservice design. You can subscribe to this website via RSS. Oh by the way, Stina is short for Christina.